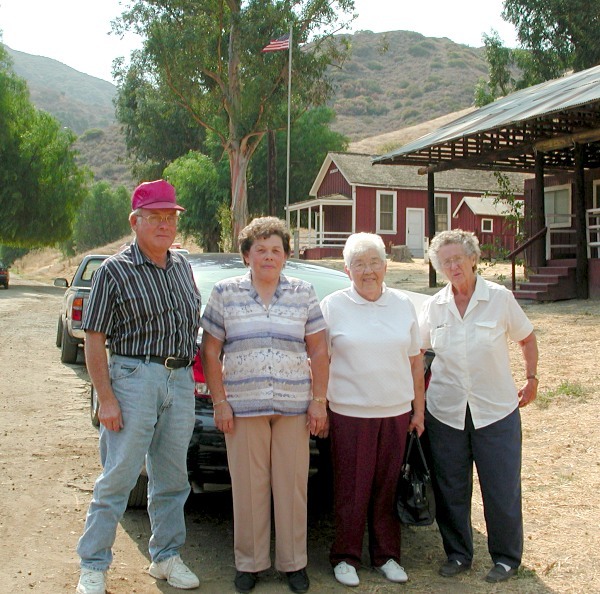 Oct. 12, 2001: (From left) John Cheney, Pauline Cheney Rowe, Nicolene Cheney Knapp and Patricia Westcott Kelly at Mentryville. The Cheney family lived in Mentryville from 1922 to c. 1938; the Westcotts lived in Mentryville from c. 1933 to 1941. (Pat Westcott Kelly now lives in Newhall.) In the background is the Felton School (built 1885, used until 1932). At right is a construction trailer. Mr. Milford Cheney (b. 1898 in Los Angeles, d. 1972) worked for Standard Oil Co. of California and moved in 1922 to Mentryville with his wife, Mary (b. 1901 in Pennsylvania, d. 1988). At first they lived in the boarding house up the canyon; they later moved to a redwood home that sat near the water tank just west of the Felton School, on the north side of the dirt road at the first leftward bend (next to a pepper tree and oleander bush that still stand). The Cheneys' eldest daughter Lois had already arrived; she was born Aug. 10, 1920. She was stricken with polio and attended Felton School although she was in and out of a children's hospital. Nicolene (aka "Nickie") Cheney (later Graham, then Knapp) came along on Nov. 12, 1924, when she was born at the hospital in San Fernando. She attended 1st and 2nd grade at Felton School in 1930-32. Only five children were enrolled after the Dill family moved away c. 1930; the school closed after the 1931-32 year and children were bused to Newhall. The Felton schoolteacher for 1930-31 was Mrs. Brown. In 1931-32 the teacher was Mrs. Brumbacher. Nicolene lives in Medford, Ore., as does her younger sister, Pauline (now Rowe), born July 21, 1931. John, the Cheneys' last child, was born Dec. 14, 1936, and now lives in Mojave. Milford Cheney was transfered to the oilfields at Taft in 1939 and moved the family to Lancaster  as close to Taft as he wanted to live. Many families literally pulled up stakes when they left Mentryville; the Cheneys, rather than take their own house with them, purchased another cabin across the road for $40, disassembled it and used the lumber in their Lancaster home. Contemporaries of the Cheneys at Mentryville were the Blaneys (foreman, 1937-38), Dills (in the 1920s), Sitzmans, Woolridges, MacDermotts, Johnsons and Westcotts. Information from Nicolene and Pauline (neé Cheney) on Oct. 12, 2001.